WASHINGTON – Over the past five years, the Obama administration has repeatedly called for cutting fossil fuel subsidies in the form of tax breaks and other incentives. But the amount of money the federal government forfeits through subsidies has increased steadily over that time period, reaching $18.5 billion last year, according to a new report from the environmental group Oil Change International. 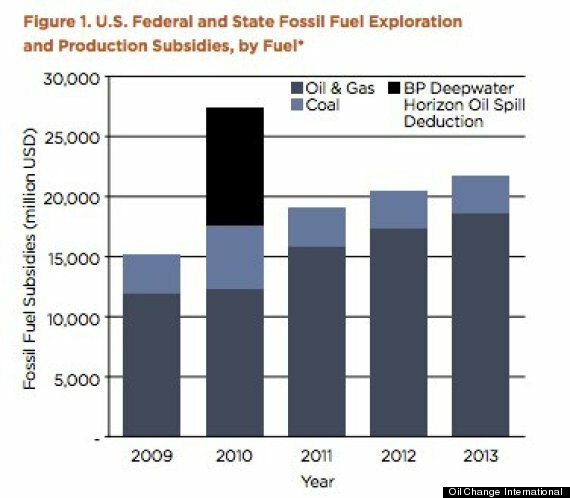 That total is up from $12.7 billion in 2009, largely because oil and gas production has increased in the United States. Next year, domestic oil production is expected to reach the highest level since 1972. The Obama administration regularly touts its "all of the above" energy strategy, which includes increased oil and gas production. In September 2009, Obama and other G20 leaders pledged to phase out fossil fuel subsidies to help curb global warming. Obama also called for eliminating subsidies in 2012 and 2013. And the administration's 2015 budget proposal again calls for a major cut to fossil fuel subsidies. But Congress so far hasn't acted to cut the subsidies. The report argues that as long as those incentives remain in place, the federal government is "essentially rewarding companies for accelerating climate change." "We're spending more taxpayer dollars every year to fund fossil fuels that we can't afford to burn, according to climate science," said Steve Kretzmann, executive director of Oil Change International. "Subsidizing fossil fuels at this point is climate denial."